In advance of the debut of The Announcement, Bill Simmons and Magic Johnson sat down in the Grantland Studios to record a two-part podcast, which will air this weekend as a special program immediately after the ESPN Films documentary. (You can watch The Announcement at 9 p.m. ET Sunday on ESPN.) 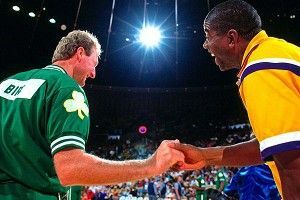 In Part 1 of the pod, Simmons and Magic discuss LeBron James’s fourth-quarter woes, spar over the ’80s-era Lakers and Celtics, and debate who would win in a matchup of Dream Teams: the 1992 squad, or the one we’ll watch in the Summer Games this year. Plus, Magic details the greatest basketball game ever played — a scrappy scrimmage between the Eastern Conference representatives on the ’92 Dream Team and their Western Conference counterparts. You can listen to the first part of this two-part podcast on the ESPN.com Podcenter or on iTunes. Look for Part 2 on Grantland on Monday, and watch The Announcement and the half-hour show with Johnson and Simmons on ESPN this Sunday.